he Youbionic Robot Right Hand v2 is a robotic hand made of 3d prints and designed to perform all movements that a human hand can accomplish. The mechanics are controlled by an Arduino microcontroller that can be programmed on a PC or Mac. 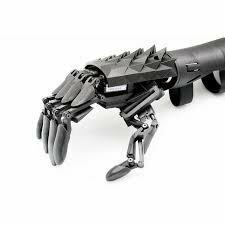 Youbionic has completely redesigned the mechanical elements, so now the robotic hand is more resistant to the efforts during operation. Also, the parameters have been modified to uplift the strength it manages to do, so it's ready for most of everyday exercise such as lift objects, tighten handles, and then interact with the outside world as a biological hand.